Whether you use an underbed trundle/storage drawer or underbed storage with dedicated drawers and shelving, there's plenty of space here for storage. School books, extra clothes, or random odds and ends can always find shelter here with under-bed storage. With small rooms, walls are critical spaces to take advantage of. 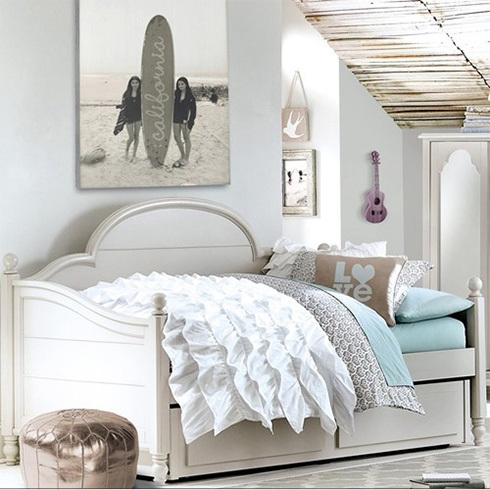 Consider choosing a bookcase bed which incorporates a bookcase into the bed's headboard. All of the storage these extra shelves provide are perfect for books, picture frames, electronics and more. Throughout different kids furniture collections, you'll find unique pieces with hidden storage! The Gabriella Collection features hidden storage in the desk chair seat, jewelry and accessory storage behind the cheval mirror, and plenty of storage drawers, shelves, and hooks behind the armoire's mirrored door. 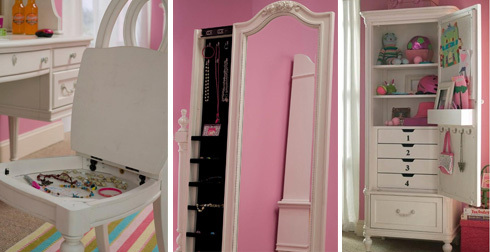 Between shelves, drawers, and hidden spaces you'll surely find enough space to store your little one's things! Get it organized easily when the furniture in their room lends a hand. Browse these styles and more at Belfort Furniture's showrooms in Dulles, Virginia or shop online at www.BelfortFurniture.com.